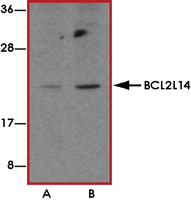 Sample Data :Western blot analysis of BCL2L14 in U937 cell lysates with BCL2L14 antibody at (A) 2.5 and (B) 5 ug/mL. 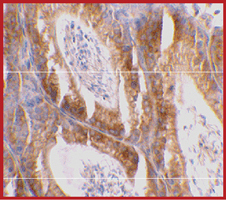 Sample Data :Immunohistochemical staining of mouse testis tissue using BCL2L14 antibody at 2 ug/mL. 2. Heiser D et al: The Bcl-2 protein family and its role in the development of neoplastic disease. Exp. Geron. 2004; 39:1125-35. 3. Guo B et al: Bcl-G, a novel pro-apoptotic member of the Bcl-2 family. J. Biol. Chem. 2000; 276:2780-5.